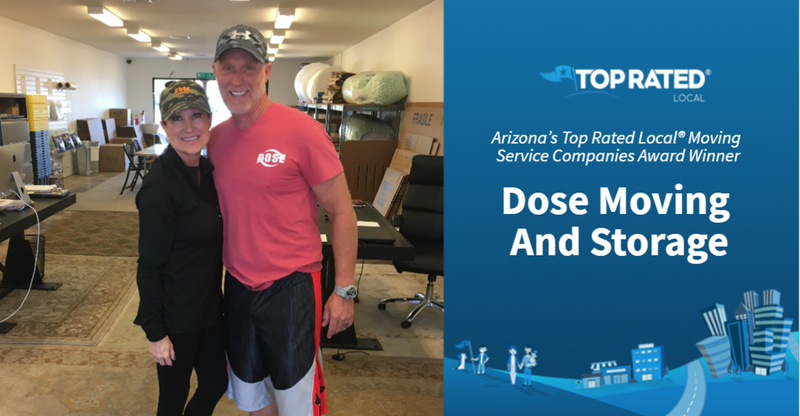 Top Rated Local® is pleased to announce that, thanks to their incredible 97.39 Rating Score™, Dose Moving And Storage is an award-winning moving company in Arizona. Whether the good people of Arizona are looking for reliable movers for a local or a long-distance move, there’s no better option than Dose Moving And Storage. Dose Moving is a different kind of moving company in many ways. For one, they offer excellent service at an honest hourly rate with no hidden fees or add-ons for fuel, stairs, blankets or any of the other extras that most other movers charge for. The Owner of Dose Moving, Marilee Dose, has a unique background in interior design, giving Dose the expertise it needs to handle its clients’ high-end furniture and homes with utmost care. Another big thing that sets Dose Moving apart from other moving companies is that the team truly respects their clients’ time. There are no breaks on the clients’ time, and Dose is committed to hiring only the best workers, who are drug tested each month. Marilee credits Dose’s strong online reputation to the company’s dedication to customer service. They provide great service to their clients and don’t hesitate to ask for reviews. Though they have a full marketing team in-house, they don’t buy leads, and they get a lot of their business from word of mouth. They have even turned down business in the past because it was not a good fit for them. Congratulations to the team at Dose Moving And Storage for being a 2018 Top Rated Local award winner! If you’re looking for expert movers in Arizona, we highly recommend Dose Moving and Storage. Visit their site today to learn more. Colorado’s Top Rated Local® Dance Schools & Studios Award Winner: RISE Dance Co.